RSTreligion, Radio Télévision Suisse, Geneva (Switzerland) : May 22 and 23, 2016. (French) - Click here!
. Prix Farel 26th edition - Click here! ​. Program - Click here! Monash University (Caulfield Campus), National Centre for South Asian Studies, Melbourne (Australia) : December 11, 2016 (English) - Click here!
. Advertisement - Click here! Advertisement 1 - Coastal Breeze - Click here! Advertisement 2 - Marco Eagle - Click here! ​Paper by Jesus Calo on the screening in - Click here!
. April 27, 2017, 7pm (French) Click here!
. May 11, 2017, 7pm (English) Click here!
. Advertisement - Nature, Spirituality and Mental Health: Making the Connection (ASMH) Click here! CREDI (Cultures et religions en dialogue), UFR lettres et sciences humaines faculté Victor Segalen, Université de Bretagne Occidentale, Brest (France) : May 29, 2017, 8pm - Click here! Quand les livres s'ouvrent, Bookstore, Auditorium du Cercle Saint Louis, Place Anatole le Braz, Lorient (France) : May 30, 2017, 8:30pm (French) Click here! May 31 & June 1st, 2017, 8pm (French) - Click here! Les Chemins de Shanti, Valpré, Lyon (France) : June 16-18, 2017 (French) - Click here!
. Seminar description - Click here! Abbey of Pradines, Pradines (France) : June 19, 2017 - Click here! Programme and description - Click here! Association Spirales, Maison de la Vie Associative, 122 Bis rue du Barbâtre, Reims (France) : June 27, 2017, 7:30pm - Click here! Centre de spiritualité St-Charles, Sherbrooke Seminary, 195 Marquette Street, Sherbrooke (Canada) : September 25, 2017 - Click here! KSF Niepokalana 2017, The 32nd International Catholic Film and Multimedia Festival (SPECIAL AWARD), John Paul II Collection Museum, Porczynski Foundation, Bankowy Square 1, Varsaw (Poland): October 1st, 2017, 4pm - Click here! Librairie Paulines, 2653 Masson St, Montreal (Canada) : October 9, 2017, 7:30pm - ​Click here! Monastic Interreligious Dialogue, Seminar on Jules Monchanin and interreligious dialogue, Abbey of Pradines (France) : October 12, 2017 - Click here! Cinéma Cinéget, Revel (France) : October 15, 2017 - Click here! American Academy of Religion, Sheraton, Boston (USA) : November 17, 2017, 8pm-10pm - Click here! 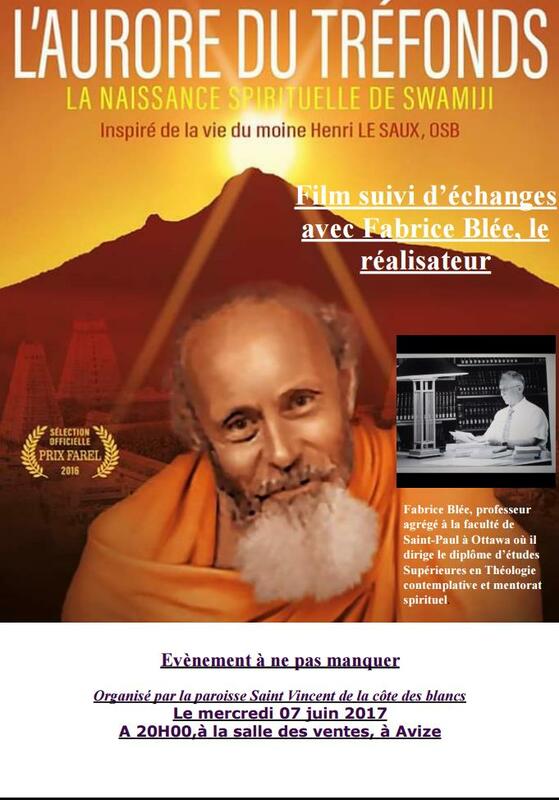 This panel seeks to examine Fabrice Blée’s documentary-film which attempts to reconstruct the formative interreligious and interspiritual experiences of Swami Abhishiktananda of his encounter with Sri Ramana Maharshi, in the caves of the holy mountain Arunachala, and make them accessible to a broader public. The session will present the film (61 min). It will be introduced by the filmmaker / director Fabrice Blée, a religious scholar from Ottawa. Following the film will be a presentation of papers including Hindu and Christian perspectives from scholars who are familiar with the film’s topic, as well as from a young scholar who is currently working on the topic. The session will be moderated by a scholar who has worked extensively on Swami Abhishiktananda and who is presently working on a related subject. Then the discussion will be opened for the plenum. Panelists: Christian Hackbarth-Johnson (University of Salzburg, Austria), Presiding; Fabrice Blée (Saint Paul University, Ottawa/Ontario), Author (Filmmaking and Theology. Reframing Spiritual Questions Based on a Visual Insight of Henri Le Saux’s Life and Message); Sudhakshina Rangaswami (Philadelphia/Chennai, indep. scholar), Panelist (Responding from a Hindu perspective); Catherine Cornille (Boston College), Panelist (Responding from a Christian perspective); Joseph Prabhu (CaleStateLA), Panelist (Sw. A’s pioneering attempt to live a Hindu-Christian life and some of the effects of that attempt on contemporary life); Nadya Pohran (University of Cambridge, UK), Panelist (On Abhishiktananda’s legacy as presented in the film and in present social media). I.T.OUCH', Boulevard Lambermont 262/286, Brussels, (Belgium) (without the presence of the film director) - click here! Institut Catholique de Paris, 21 rue d'Assas, Paris (France) : June 5, 2018, 6:30pm - click here! Brorson's Kierke (17th c. Church of Sören Kierkegaard), Danmission (Danish Missionary Society), Copenhagen (Denmark) : June 10, 2018 - click here! University of South Africa, Symposium on Spirituality, Theology and Education, Pretoria (South Africa) : September 21st, 2018. After the screening, I gave a lecture entitled: Filmmaking and Theology: Towards a Didactic and Mystagogical Perspective. Cinéma Le Mas-d'Azil, Le Mas d'Azil (France) : September 23, 2018.